Posted on Monday, March 3rd, 2014 at 9:55 pm. This heart healthy recipe packs a ton of flavor and is perfect for an easy meatless weeknight meal. It’s also delicious cold the next day for a healthy and filling lunch. Barley is a under-appreciated whole grain that helps lower cholesterol and is loaded with vitamins while keeping your belly full and satisfied. Broccoli is also vitamin rich, lowers cholesterol and helps detoxify the body, however it is often over cooked eliminating the nutrients it has to offer. 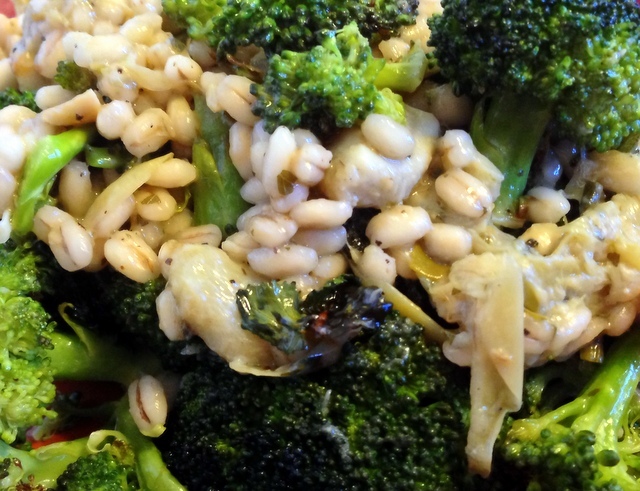 Roasting the broccoli enhances the health benefits while adding a rich nutty flavor that will make it difficult to cook broccoli any other way! Preheat oven to 400 degrees. On a parchment lined baking sheet toss broccoli florets with two tablespoons of We Olive Arbequina Extra Virgin Olive Oil, salt and pepper. Roast for 15 minutes until crispy and brown. In a medium sauce pan, bring broth and barley to a boil over medium high heat. Season with one teaspoon salt, cover and reduce heat to low. Cook for 15 minutes or until all liquid has evaporated. Add tapenade and remaining olive oil to barley, stirring to coat. Add broccoli, taste and adjust seasoning with salt and pepper and serve.